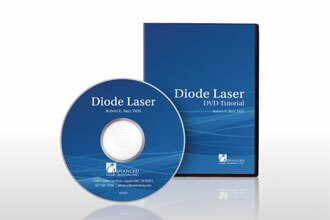 Advanced Laser Training Presents the Diode Soft Tissue Laser DVD, this entertaining, informative DVD includes 22 chapters on the most commonly performed soft tissue procedures. Topics include, fiber preparation, crown lengthening, perio and much more. Watch the procedure to review settings and techniques prior to treating cases. Advanced Laser Training courses are designed for dentists, dental hygienists and dental assistants at all levels of expertise. Information shared in our courses is developed from clinical research and includes the most current information available from evidence-based dentistry. Completing a single continuing education course does not provide sufficient information to result in the participant being an expert in the field related to the course topic. It is a combination of many educational courses and clinical experience that allows the participant to develop skills and expertise. Advanced Laser Training, INC. is designated as an Approved AGD / PACE Program Provider by the Academy of General Dentistry. The formal continuing education programs at Advanced Laser Training are accepted by AGD for Fellowship, Mastership, and Membership Maintenance Credit. The current term of approval extends from 3/1/2013 - 2/29/2018. Provider ID: # 351393. It is our understanding that the states of Arizona, Kentucky, Nevada, New Hampshire, Pennsylvania, Tennessee, Texas, Wisconsin and Wyoming do NOT accept online courses for their laser training requirements, in those states a LIVE course including hands on training is required. Advanced Laser Training, Inc. All rights reserved.